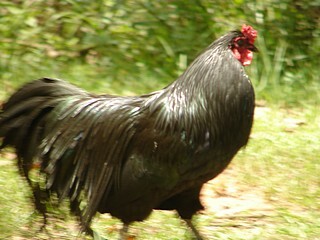 Sumatra Chickens are a stylish bird with lustrous black plumage. They are also excellent fliers as chickens go. Comb, Wattles & Earlobes: They have a small pea comb and very small almost non-existent wattles. Their earlobes are also very small. All are referred to as gypsy. Black: The most prevalent color and they have standard black plumage. Special Qualities: A gorgeous bird with a lustrous plumage. This is an ancient breed. They are also possibly the best fliers in chicken town, as it was once reported that one of these birds actually made a 5 mile, wind aided journey from the island of Sumatra to the island of Java in Indonesia. The bird was first brought into the United States in about 1847 for cockfighting purposes. The breed is very active and are not only one of the best fliers, but also great jumpers. It is recommended that you keep them in covered cages if you want to keep them in. Many breeders have found this to be a challenge. The breed is a very stylish bird and quite beautiful as they have one of the most lustrous plumage's of any bird. They are known for their strut and swagger and their faces are referred to as gypsy, which is a dark plum to almost black shade of purple. They have glossy black legs. The roosters are known to fight other roosters of the same breed, but rarely go after other breeds. The hens are really broody and good mothers, but they begin laying later in the season than other breeds. Sumatra Chickens were first recognized by the APA in 1883.